In fewer than 24 hours, Jamaican sprinter Yohan Blake could be a gold medalist in the 200-meter sprint, if he can find a way to top Usain Bolt. Yet Blake's wrist might get much more attention from the International Olympic Committee than Bolt's entire body thanks to something Blake wore during the 100 final: A custom, $500,000 watch made by designer Richard Mille. 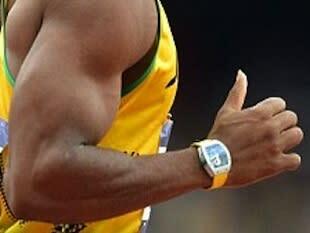 As reported by Britain's TNT Magazine and a handful of other English sources, the watch, which you can see in the photo on the right, is a customized sports watch in the green and yellow colorway of the Jamaican flag. Officially, the timepiece is called a Richard Mille Tourbillion watch, and the one-of-a-kind piece of functional jewelry was designed specifically for Blake to wear at the Games. Blake followed through on his part of the bargain, wearing the watch during the semifinals and finals of the 100-meter dash, an event in which he finished second, behind countryman and world-record holder Usain Bolt. Yet that has infuriated IOC officials, who have phenomenally strict regulations about what athletes are allowed to wear while competing at the Games. According to strict sponsorship regulations, Olympic athletes are only allowed to wear gear that is part of their country's sponsored apparel. Similarly, if athletes use a piece of equipment that isn't strictly clothing, they are required to use the official sponsor of the Olympics in that category. Omega is the official watchmaker of the Olympic Games. Richard Mille is not. That may create a very large problem for Blake, who could now be facing a significant fine as he prepares for his final individual event of the London Games. It's worth noting that this isn't the first time Mille has sponsored a major athlete at a significant event. In June, Rafael Nadal wore a $525,000 Mille Tourbillion watch during a match at the French Open. Similarly, American golfer Bubba Watson wore a $525,000 Tourbillion during a PGA event, drawing the ire of commenters on a handful of golf blogs. Yet neither Nadal nor Watson was facing any kind of a fine for their watch antics. Blake is, and could find out as soon as Thursday what kind of punitive fines he'll be handed for wearing an unsanctioned watch. 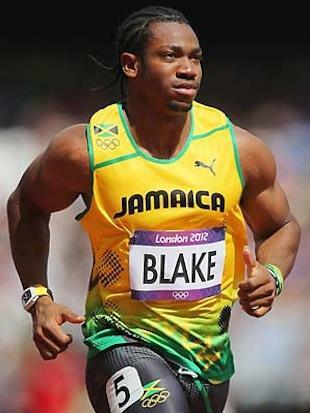 After all, the IOC has to act fast, or else Blake could wear the watch again during the 200-meter final Thursday night. You might even say the IOC is on the clock ... whether it's made by Omega, Richard Mille or anyone else.